Just before christmas, when I was actually supposed to start studying for my exams, I finally got my sewing mojo back. 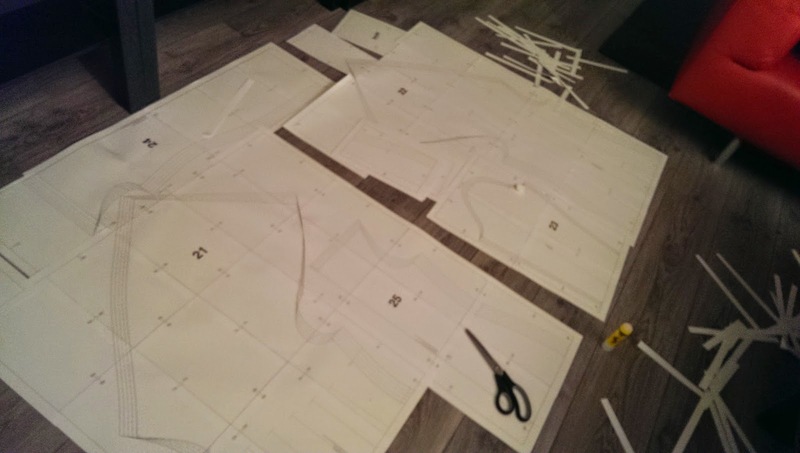 More than 60 pages of printout, 30 minutes of frantic cutting paper edges and glueing pattern pieces and cutting out the pattern, while some of the contained pattern pieces weren't even needed for this version of the dress, but only for a variation of it - for which the instructions were of course NOT contained in my download. Ironically, the dress I had picked was contained in the current Burdastyle magazine - since the Dutch version contains the same patterns as the German one, I could have spared myself a lot of crawling around on the floor with glue and scissors, by a 2-minute-trip to Albert Heijn around the corner. Anyway, enough ranting, while the fabric wasn't the nicest jersey to work with, and the pattern itself isn't that spectacular, I'm happy. Comfortable work-proof cold-weather-dress. A new favorite in my wardrobe, I think! Now that all my boxes, patterns, costuming books, and my mannequin Ada are finally here, I'm a little more enthusiastic as well.